Today’s Sunday Sesh is a short one. We’ve had a huge weekend up on the range with the Carnival of Flowers kicking off and entertaining visitors. 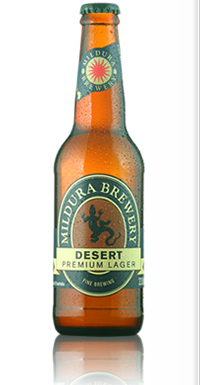 Today’s brew is Mildura Desert Premium, made by the Mildura Brewery in Victoria. This is a nice lager. I didn’t do the usual pour test, preferring to drink this one straight from the bottle. Due in part to the fact that I shared a 6-pack with my brother, who also “Mmmm’d” over this one. When I first tasted this, it reminded me of a brew I had tried awhile ago, but couldn’t put my finger on what it was. When the Bro had a swig, he hit the nail on the head – it tastes just like Uncle Neal’s home brew – at least, what Bro and I both remember of it. After thinking on that for a bit, I’m not entirely sure when I would have tasted Uncle Neal’s home brew. It may have been one family Christmas, when I may (or may not) have been given a sneaky taste by one of my many Uncles (or, in fact, my father). Or, we may have cracked one illegally (the cousins and I) while hiding in the car shed, or up the cane paddock. I don’t think the latter would have happened though, because I am sure I would have remembered the flogging we would have received afterwards, and hence the drinking of the offending beer. Anyway, drinking this brought back memories of sitting with my Uncles at family get-together’s all comparing their home brews and discussing the cricket. Wonderful stuff when a drink can evoke memories, and for anyone who remembers Uncle Neals’ home brew, give this one a try. We had it with Bro’s spag bog, and it went down a treat. With a price tag of $16.99 a 6-pack though, it might be one for the specials shelf. Little bit of a rant to finish things off today. Part of the reason this post is late is because I’ve been trying to sort out the new internet connection. Apparently, downloading a movie to a t-box stuffs everything up. We won’t be trying that one again for awhile. And yet again, I am sitting near the tv cabinet with the laptop plugged in to the modem just to get a connection that works. I’m hoping that after all the swearing and threatening I have done over the past couple of days, the t-box, modem and wi-fi will play nice and get back to doing what I pay it to do. How the hell am I going to procrastinate without a proper internet connection? Lastly, I read in the paper today that the State Government is looking at the distribution of public holidays. About time I say. The more public holidays we have, the less reason we’ll have to take a sickie. And they should look at spreading them out a bit more too. There’s too many in the first half of the year. But instead of re-distributing them, just add a couple more for the end of the year. Number one on my list would be an Oktoberfest holiday in October. We’ve got plenty of German immigrants, and I think that would be a perfect way for us to help them keep connected to their culture. November could have the first day of the first cricket test as a public holiday. I’m sure there’s many more reasons in the second half of the year to introduce a new public holiday but these would be my top two. Before I go – how about Darren Lockyer. What a cracker of a match. My tip – a Broncos/Storm grand final. As always, I value your opinion. Let me know what you think of the beer I’ve reviewed, and I’m open to requests. Also, any other ideas on new public holidays for the second half of the year?